Ah, Monaco. The harbour with ships bigger than a six-story building, the casino which at night sees drones of screaming groupies on the doorstep with their photo cellphones ready to snap Justin Timberlake or any other celebrity popping out for a smoke. What about those high-rise apartment blocks, almost all completely blacked out at night? Is there anybody home? And the people who have stayed behind seem totally comfortable with the circus that shuts off major parts of the city for over a month. Then again, considering the average Monaco wealth they probably have other things to worry about. Or nothing at all, since most are likely to have at least five other comfortable places to live. Whatever people say, it’s a special place. As a paradise for the rich and famous, Monaco makes you feel completely out of touch with the mundane world’s harsh realities. Where else would you see a picture like this? Only in Monaco. 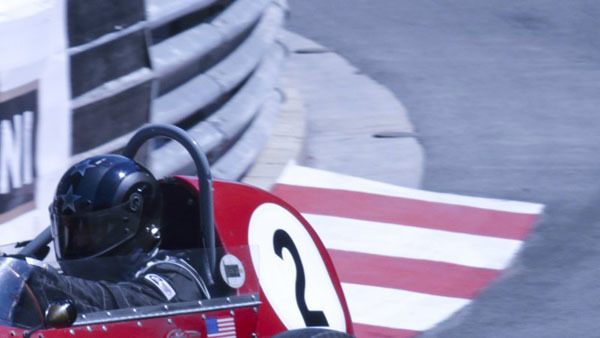 There aren’t many local race fans among the tax haven’s 32,000 residents – perhaps they are even outnumbered by the racing drivers who have sought domicile in Monaco – so most of them come flocking from abroad. And with the glamour transferring from the modern Grand Prix to its historic curtain-raiser, they’ve started to come from all over the world, just to watch a valuable collection of racing cars strut their stuff. Fortunately for most, that’s still the main attraction – which can’t be said for ‘the other race’. So what to do when you get to Monaco proper? Well, if you get the opportunity to circle the track with your road car before they close it off for ‘urban circulation’, then do so. You can also wait until Saturday or Sunday evening to grab your chance. 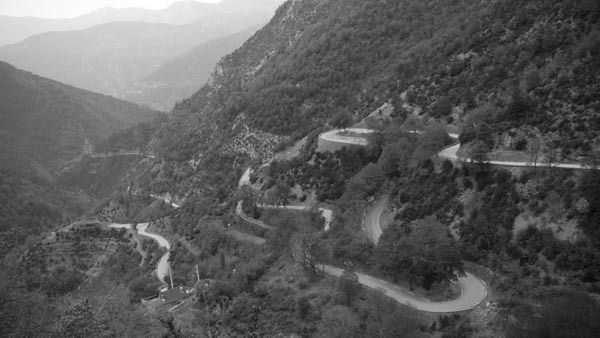 You’ll get a good appreciation of the undulating character of the track – the steep uphill climb from Ste. Devote is really that steep, the bump on Casino Square is even bumpier than what it looks like on TV, and the dive down from Mirabeau all the way down to the tunnel is over before you know it. Does that tunnel have a second apex at the end? Yes, it does! 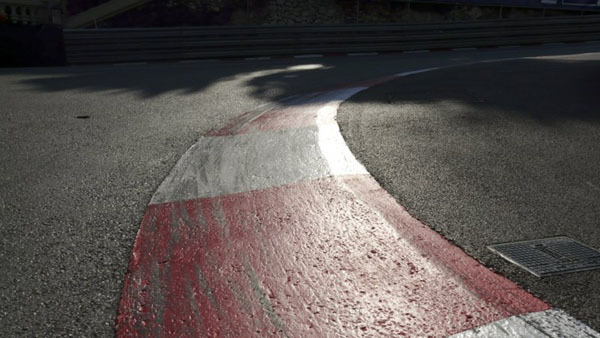 And how about riding the kerbs at the chicane or around the swimming pool? When driving a road car with sports suspension you’ll get a real buffeting. So what about the racing? Well, there was plenty of it. Some of it with accomplishment, some of it drenched in misery. We saw magnificent overtaking and hideous blocking, brilliant four-wheel drifts and silly mistakes, and then some more silly mistakes. Pure dominance balanced out with utter defeat and, as usual in historic racing, the best drivers racing the best-prepared machinery made all the difference – which in some cases amounted to several seconds per lap. But then you don’t go and see a historic event to witness the picture-perfect re-enactment of races past, or else you would be shocked to find that a Tec-Mec beat a Dino, a Scirocco finished second and a 312T languished in the back. Instead it’s about seeing the cars back in their natural environment, at the speeds (well, almost) that they used to be driven in the olden days, with all the noise, smell, and other sensory overflow that come with the territory. Judging it from that perspective the 2008 Grand Prix Historique de Monaco was bound to be a huge success, if only by looking at the entry the ACM had managed to attract. And so it was. Race morning got off to a good start with the Juniors performing their traditional kick-off event. The Pecheurs parking that had been transformed into the Junior paddock (and provided parking space for the accredited media as well) provided an interesting backdrop for a varied field of both front- and rear-engined FJs, the two distinct shapes mixing it together, unlike the biannual alternation scheme used at the Revival Meeting. Tony Goodwin’s Gemini was on pole, but he was beaten at the lights by fellow front-row man John Monson in his BMC. Michael Gans, who had qualified in third, disappeared after two laps, leaving the battle for third to Massimo Comelli’s OSCA (in which Colin Davis raced in the 1960 Monaco FJ race), John Chisholm’s Gemini and Simone Stanguellini in one of the many cars bearing his grandfather’s name. Comelli had to retire with a flat tyre with two laps to go, while Stanguellini’s spin at Rascasse wasn’t enough for Chisholm to take third. The lead battle was fierce until Monson and Goodwin found backmarker Andrea Giuliani in the ex-Baghetti Lancia-Dagrada in their way. Somehow Monson found a way past between Rascasse and Anthony Noghes, but then the ultra-slow Giuliani did some more blocking out of Anthony Noghes, sending Goodwin into an almost spin which cost him the seconds that he needed to stay in touch with Monson. It was the decisive event of the race and the two doctors at the front ran out the race in that order. This meant that the pre-war Grand Prix race was left to the teams and blokes that did care. 26 cars lined up for the start, with GK Racing’s 4CL a non-starter after the car smoked its engine on Saturday afternoon. The 10-lap event turned into a two-horse race between the two front-row men, Mac Hulbert in the ERA D-type and Paul Grist in his Tipo B. In the end poleman Hulbert won it by two seconds. You’d think the field being bunched up by the safety car after Ed Davies (Alfa Monza) spun on the climb to Massenet would have opened up opportunities for others but Hulbert and Grist determinedly strode away again after it had gone. The battle for third was won by Willi Balz’s 6CM. There were several interesting cars to watch out for in the pre-1961 front-engined Grand Prix car event, such as two Gordinis taking on the Revival regulars, but as far as the lead battle was concerned, it was a pretty uneventful race. With Duncan Dayton and Joaquin Folch having set qualifying times that were a full five seconds faster than third-place qualifier Barrie Baxter, the 10-lap dash was always going to be between the two Lotus 16s. The excitement took a nosedive when Folch headed into the pits at half-distance, leaving the American ALMS racer to romp away to a commanding win. It looked like a Sunday stroll in the park. Attention soon diverted to the battle for what was now second place between Barrie Baxter in the Tec-Mec and Tony Smith in the Ferrari 246. For a while it looked like Smith had gained the upper hand but Baxter took his place back, the pair crossing the line separated by two tenths. Nick Wigley in the Connaught A-type finished a lonely fourth. Time for lunch and demos. 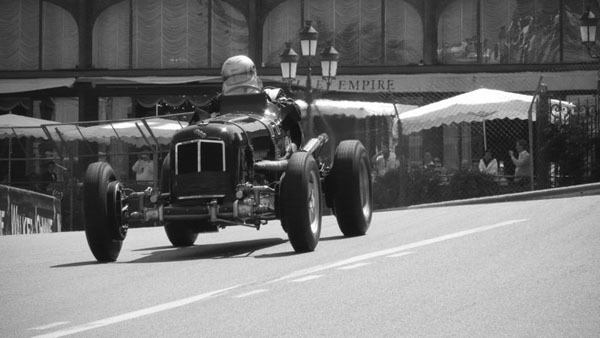 After the historic bikers had done their thing – pity about those red things they had wear over their period leather – the track was cleared for the pièce de resistance: the Auto Union demonstration. 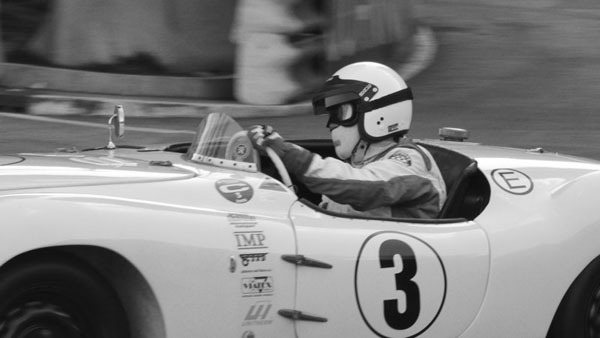 Since Chopard is the Grand Prix Historique’s main sponsor and its director is performing navigating duties for Jacky Ickx in the historic Mille Miglia the Belgian was the obvious choice as a driver. The former Monaco Clerk of the Course’s drive wasn’t announced in the programme but from the Audi Tradition website we knew the priceless C-type replica built by Crosthwaite & Gardiner was going to be there. But you couldn’t be blamed for missing it all the same. As we already said Ickx drove just three laps, including out and in laps, and chose his braking points – or should we say lifting-off points? – miles away from what the Série A runners had been doing. So instead of hearing that wonderful supercharged noise all the way across the straight, the people at Ste. Devote were treated to an Audi R10 diesel imitation. Pity. We wish Audi would allow drivers to explore the limits of these machines just a tiny bit further. Still, it was great to at long last see a Silver Arrow back in the streets of Monaco, and we should be thankful for that. 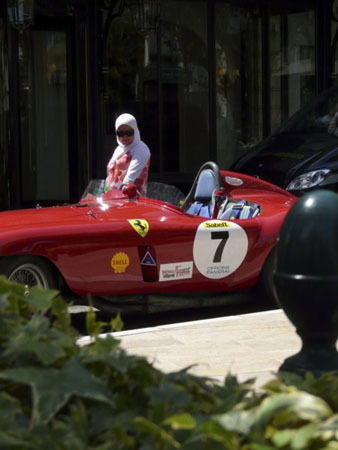 The Ferrari demonstration brought more much anger and violence to the track – and not just with regards to decibels. The high-pitched sound of modern V10 engines might not be everyone’s cup of tea but it certainly gets your attention. Apart from that, it’s very impressive how much further the shriek of these rpm monsters carries compared to a seventies DFV or even the Ferrari flat-12, especially in the streets of Monaco. Only the Matra V12 came close. And compared to Ickx the Ferrari F1 Clienti drivers were definitely trying! 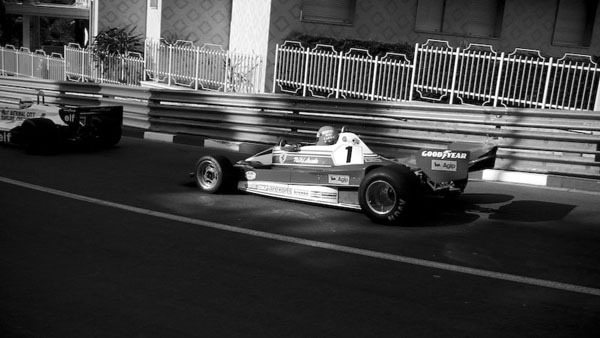 So much so that we got a red flag halfway through the demo, the cause being two very recent Ferrari F1 cars sans left front wheel… Klaas Zwart in Alesi’s 412T2 – the last of the high-revving V12s – was going balls-out as well but at least he knew what he was doing. It was also a joy to see Jo Vonlanthen in the ex-Ascari 500 manage to keep up with some of the newer stuff. Other treats were the 1972 312B2 and its disastrous successor, the 312B3 ‘Spazza Neve’. The same applied to Berger’s F187 and Mansell’s 641. Now it was time to get serious again with the 1.5-litre rear-engined Grand Prix cars. There was huge variety, with the Scirocco, Emeryson, JBW and BRP all turning up to join the legions of Coopers and Lotuses and the occasional Brabham and BRM. Marco Cajani brought further interest with his Alfa-engined De Tomaso. The race was a rather straightforward affair, however, with Simon Hadfield having qualified three seconds faster than his nearest rival, James Hanson in the stunning Scirocco, the car going faster than it’s ever done in period. 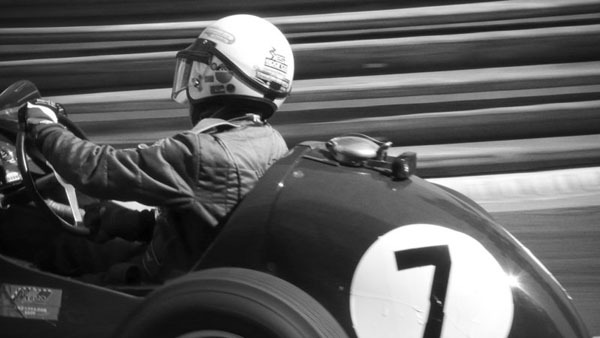 In fact, it finished an unchallenged second, well ahead of local hero Marcus Mussa in the Lotus-BRM 24 who did well to get ahead of third-place qualifier Alan Baillie’s Cooper, while Frank Sytner’s challenge faded on lap 4. But the victory spoils went to Hadfield in his Lotus 21, who went unthreatened during the entire 10 laps. So on to the first of the two main events that would run for 15 laps each – the pre-1975 3-litre F1 race. This proved to be much tighter. As far as drivers were concerned the grid featured the same front row as the Série B race, Duncan Dayton in the 1970 Brabham BT33 leading Joaquin Folch in the 1974 McLaren M23. They were followed by Manfredo Rossi Di Montelera in the beautiful 1973 Brabham BT42/44 and Frank Sytner in the 1974 Hesketh 308. 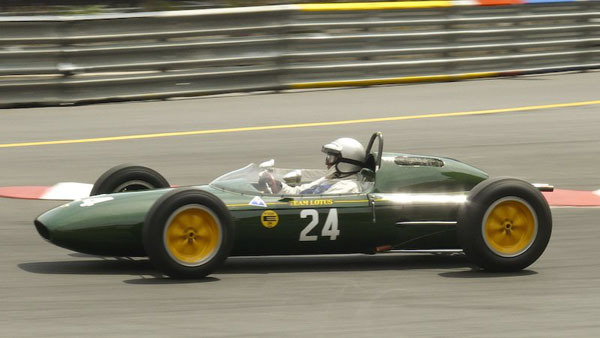 The field was divided in three classes, with the two V12 Matra MS120s forming a class of their own while four cars made up the sixties class – Robs Lamplough’s 1967 BRM P133 (which he seems to have owned since 1968), two Ferrari 312s (one in ’67 spec, the other from ’69) and the ex-Bianchi Cooper T86C. The V12 class had originally been bigger but the two Tecno cars did not start. Sadly, the 1972 PA123 driven by Nanni Galli failed to be part of the show on Sunday, while the ‘Goral’-penned E731, unraced in period, lived up to its reputation by running only briefly in practice. Other interesting non-runners included the Iso-Marlboro FX3B and the Token. This meant that GP Masters series organiser Ron Maydon’s Amon AF101 was the only real back-of-the-grid DFV kit-car that took to track to challenge the McLarens, Tyrrells and Brabhams run by the opposition. And well he did, taking fourth place from Sytner when the latter had to retire one lap from the end. It was a very lonely fourth though, the field having been severely shaken up by a safety car that failed to pick up the leaders when it entered the circuit at the halfway point of the race after Hamish Somerville’s BT37 dropped out of fifth place. Until that moment Dayton, Folch, Rossi and Sytner had been running as a fairly close leader group, with a big gap to Somerville and another big gap to Maydon. Then followed a group of Andrea Burani (McLaren M23), Yves Saguato (Matra MS120C) and Jeffrey Lewis (Tyrrell 007), Saguato and Lewis swapping places before the safety car came out when the Frenchman went straight on at Rascasse. Further back, Richard Carlino (Surtees TS9B) overtook Jean-Louis Duret (Lotus 77) for tenth place before Duret retired the Lotus. In the sixties race-within-a-race Brad Hoyt had things fairly under control in the ’69 312 but he was always followed closely by Lamplough and Jean-François Decaux in the other 312, Robs eventually passing Decaux for second right at the end. At the front, Dayton and Folch formed a smaller lead group, with Rossi slipping away, and the two leaders made it an entertaining battle until the chequered. It was the American who prevailed again, and it speaks volumes for the man’s ability that he won in an ‘old’ 1970 car. It was much better than Tim Schenken ever managed with the car at Monaco… Folch’s particular chassis had a lot more history to it: Fittipaldi won the 1974 Canadian GP with it, and it was still successful in 1976, Hunt winning the Canadian and US GPs in this tub, and driving it to third in Japan to clinch his title. In 1977, a certain Gilles Villeneuve made his GP debut in Britain driving this car. A lot of things were flying around in the post-1975 3-litre F1 race – body parts, stray wheels, you name it. It added to the spectacle of the biggest race of the afternoon, which saw professional Pontiac Grand-Am driver Paul Edwards take a dominant pole in the ex-Watson Penske PC3. He was joined on the front row by a P34 sixwheeler but Martin Stretton wasn’t at the wheel. Instead, Italian Mauro Pane was leading the two Ensigns (local hero Jean-Pierre Richelmi’s N175 and Belgian former touring car ace Jean-Michel Martin’s N177) that monopolized the second pane. Stretton was fifth, ahead of Peter Dunn in the Ovoro-liveried ex-Merzario March 761. The last of the men who featured up front qualified seventh: Katsuoki Kubota in his Williams FW06. 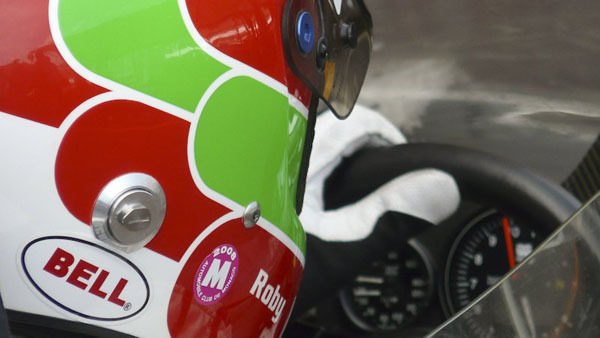 Bobby Verdon-Roe should have lined up eighth in his M26 that he races since 2006, but was a spectacular non-starter. At a time he was heading morning practice and looked like the bright new addition to historic F1 racing that brought him victory in the 2007 Porto event. But then it went horribly wrong when he clipped the wall on the exit of the tunnel, having run slightly wide. It was a big knock and the ensuing carambolage all but destroyed the lovely McLaren. With damage like that it was impossible to get it ready again for Sunday and Bobby had to forfeit the race. Closing off the day were the pre-1953 sportscars and as usual these looked the most entertaining of all, as they shifted their weight violently from one set of springs to the other to give us the best slides of the day. John Ure in the Frazer Nash Le Mans Replica was on pole, followed by the C-types of Nigel Webb and David Wenman. With the cars in front of him quickly disappearing or not even starting at all, David Franklin in the BMW 328 quickly took up fourth place and easily kept it until the end of the 10 laps – a fantastic job. At the front, Webb had jumped Ure at the start but threw away his chance of victory with a mistake at Rascasse, allowing the Frazer Nash back into a lead it would never give up. The two Jags would be nose to tail for the remainder of the race as Ure disappeared in the distance, with Wenman pouncing on the very last lap to take second. 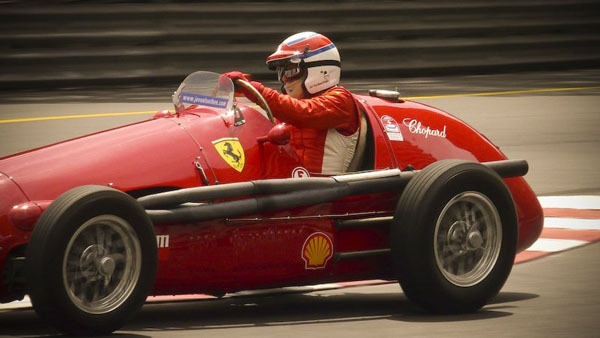 Further back, there were entertaining duels between Michael Willms in the Ferrari 340 America and Simon Diffey in the little Cooper-MG, and José Fernandez in the Ferrari 225S and Chris Phillips in the Allard J2X. These two pairs were followed by Miroslav Krejsa in the lovely and unique Skoda 1101 Sport, the Czech sharing the honour for most sideways driver with Patrick Blakeney-Edwards in another 328. Meanwhile, Sir Stirling had been in trouble before the start and was late getting away. After a couple laps he was still trailing the entire field by quite a distance. But soon enough the 79-year-old caught up with the back of the field and eventually passed six cars to finish 18th. It was nice to catch him on camera after the race, as he stood next to the statue of his great friend and rival Juan Manuel Fangio. Well done.